Because AWS Elastic Beanstalk performs an in-place update when you update your application versions, your application can become unavailable to users for a short period of time. You can avoid this downtime by performing a blue/green deployment, where you deploy the new version to a separate environment, and then swap CNAMEs of the two environments to redirect traffic to the new version instantly. Blue/green deployments require that your environment runs independently of your production database, if your application uses one. If your environment has an Amazon RDS DB instance attached to it, the data will not transfer over to your second environment, and will be lost if you terminate the original environment. 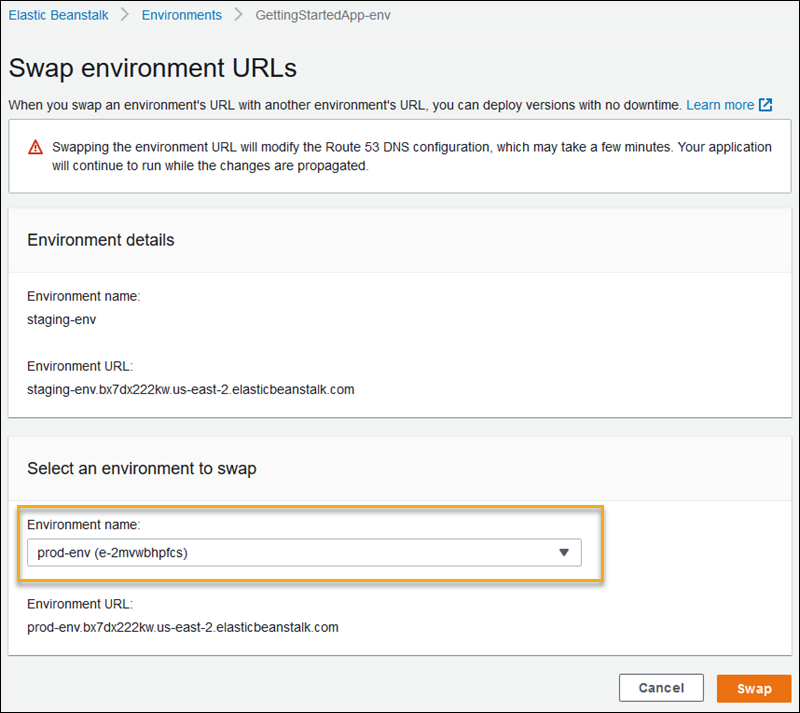 For details on configuring your application to connect to an external (not managed by Elastic Beanstalk) Amazon RDS instance, see Using Elastic Beanstalk with Amazon Relational Database Service. Clone your current environment, or launch a new environment running the configuration you want. Deploy the new application version to the new environment. Test the new version on the new environment. From the new environment's dashboard, choose Actions, and then choose Swap Environment URLs. From the Environment name list, select the current environment. Elastic Beanstalk swaps the CNAME records of the old and new environments, redirecting traffic from the old version to the new version and vice versa. After Elastic Beanstalk completes the swap operation, verify that the new environment responds when you try to connect to the old environment URL. However, do not terminate your old environment until the DNS changes are propagated and your old DNS records expire. DNS servers don't necessarily clear old records from their cache based on the time to live (TTL) you set on your DNS records.